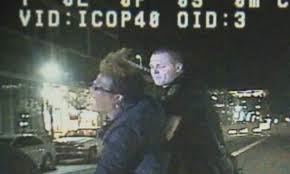 TEMPE, Ariz. (AP) -- An Arizona State University professor is facing an aggravated assault charge for allegedly kicking a school police officer who was trying to arrest her. ASU police say Ersula Ore was walking in the middle of a Tempe street near campus on May 20. Court records show Ore refused to provide her driver's license to a university police officer and was warned she would be taken into custody if she didn't comply. Police say Ore allegedly kicked the officer in the shin after she was finally handcuffed and an ASU police vehicle was damaged during the scuffle. They say Ore was booked into jail on suspicion of aggravated assault and several misdemeanors. Ore is an English professor at ASU. It was unclear Thursday if she has lawyer yet for her case. (UPDATE: VIA The Huffington Post.) The school said in a statement, "ASU authorities have reviewed the circumstances surrounding the arrest and have found no evidence of inappropriate actions by the ASUPD officers involved. Should such evidence be discovered, an additional, thorough inquiry will be conducted and appropriate actions taken." The Arizona Ethnic Studies Network believes this incident may be connected to racial profiling, and is criticizing ASU for not undertaking a full investigation of the incident with Ore, who is black. "In a state and metropolitan region in which racial profiling has been proven to be widespread, the ASU administration's lack of concern for the well-being of an ASU community member of color is unacceptable," the Arizona Ethnic Studies Network said in a statement. Ore did not immediately respond to a request for comment from The Huffington Post. A petition on MoveOn.org with more than 2,800 signatures is calling on campus police to drop the charges and issue an apology. The ASU Police Department is enlisting an outside law-enforcement agency to conduct an independent review on whether excessive force was used and if there was any racial motivation by the officers involved. In addition, although no university police protocols were violated, university police are conducting a review of whether the officer involved could have avoided the confrontation that ensued. The Maricopa County Attorney's Office has independently reviewed all available evidence, including the police report, witness statements, and audio and video recordings of the incident, and decided to press criminal charges of assaulting a police officer, resisting arrest, refusing to provide identification when requested to do so by an officer, and obstructing a highway or public thoroughfare. The charge of assaulting an officer is based on the fact that Dr. Ore kicked the officer as she shown on the video and as she admitted in her recorded statements to the police.